The perfect gift. 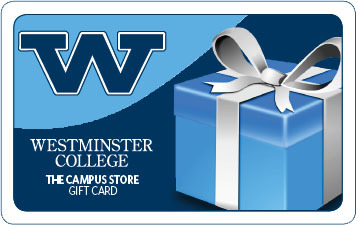 Use the Gift Card towards the purchase of goods at both the Westminster Bookstore and the Titan Gift Shop. USPS shipping free of charge on Gift Cards. Please select option for Westminster College Gift Card. "So, essentially this is the deal. I know that you don't have much Westminster gear yet, and I searched and searched to find the perfect item... I decided that this might be the best way to get you the right thing; by letting you get it yourself! So here you go! Congratulations, Zach. Love ya! -Britt"